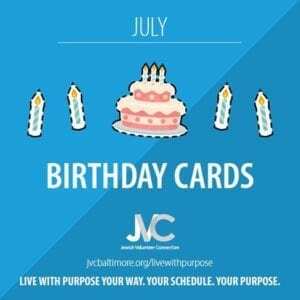 This summer, join JVC to Live With Purpose by decorating birthday cards that will be given out throughout the year to children in our community. Who are we helping? Cards will be donated to Sarah’s Hope and St. Francis Neighborhood Center. Decorate the card with crayons or markers. Did you know? Children who have experienced homelessness are three times more likely than their peers to experience emotional problems such as depression, anxiety, low self-esteem, and stress. Learn more about how JVC makes sure children in our community get to celebrate their birthdays in style, and use these discussion questions with your family/group! Stay tuned! Materials coming soon! To request cards to color, please fill out this form and JVC will get back to you within 2 days. Supplies can be picked up at the Park Heights JCC, after coordination with staff. Once the project is done, you will also drop off at the Park Heights JCC. Alternate arrangements can be made as needed. If you’re interested in obtaining supplies for this project and supporting JVC’s Live With Purpose, see below.